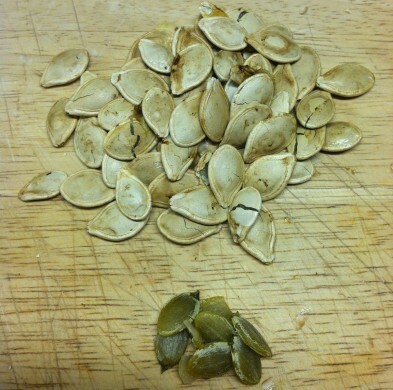 The first time I attempted to roast pumpkin seeds was when I was 8 years old. My school had a pot-luck fall party planned, so I followed the directions in a little kids’ cookbook I had to make pumpkin seeds to take with me. My cookbook instructions said nothing about shelling them. The teachers must have thought they were strange because my little bowl of seeds never ended up on the food table. I was crushed and had no idea what had become of my offering. 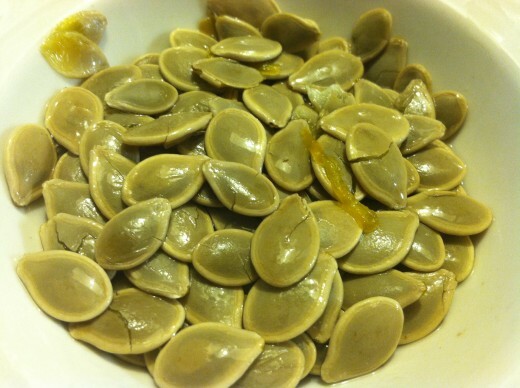 I actually did a little research on the subject since I’ve been struggling from that wee age to find a quick and easy way to get inside the hard shell of a pumpkin seed to the soft nut inside. The consensus seems to be that using a rolling pin to crack the shells of the roasted seeds is the best way to get them open. After trying it myself, I would have to agree. They are much easier to peel once the shell has been split. A little more difficult to shell than sunflower seeds, but doable for nibbling. 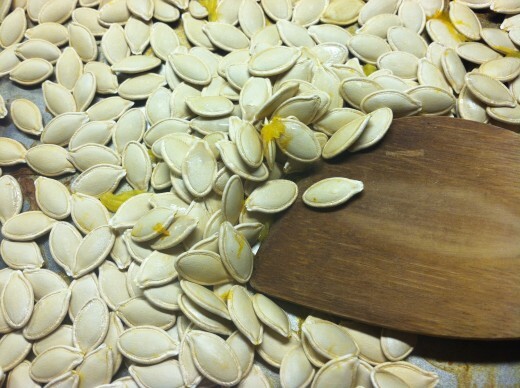 To efficiently remove a lot of seeds from their shells, however, so that they can be used in cooking, the best way is to boil the roasted, cracked seeds. I boiled mine for 5 minutes before they began slipping from their shells. I prefer the taste of the roasted seeds to the boiled. The flavor is a little like edamame, while the roasted ones taste like overcooked lima beans. 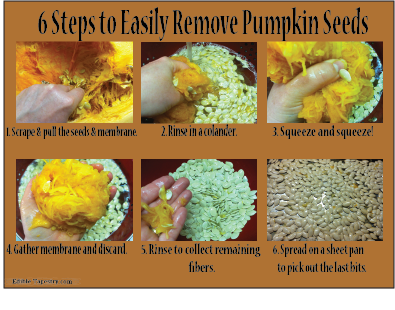 I’ve found that the quickest way to remove the seeds from a pumpkin is to just scrape all the stringy membrane from the hull, and dump it into a colander for rinsing. By repeatedly squeezing what will quickly become a mass of fiber, the slippery seeds will pop out and land in the bottom of the colander. A thorough rinsing will push the remaining strands to the bottom where they can easily be gathered. When they are spread out on a sheet pan for roasting, the last tiny bits can easily be picked out. The stringy remains go to the chickens, of course. If you have them. Mine just love pecking through them! 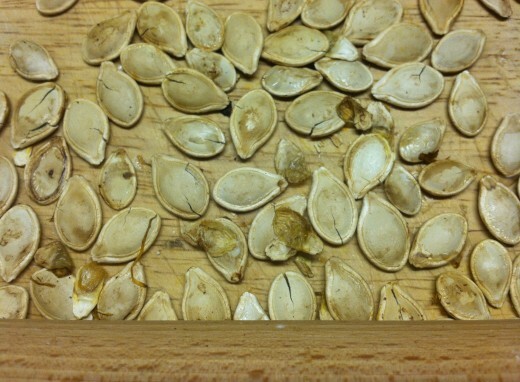 After the seeds are removed, I roast them in a 350 degree F oven for 10 minutes and then give them a stir. Then I roast them for 5 more minutes and stir them again. After a final 5 minutes in the oven, they are done and can be cooled on a cutting board, ready for rolling and splitting. Pepita are high in potassium and magnesium, so munch away! They are also said to destroy intestinal parasites, something I try not to think about, but have decided I must face after reading that if you’ve ever pet a cat, dog, or eaten pork, you’ve got them. 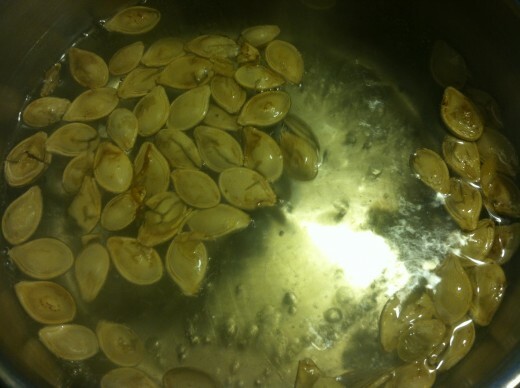 I really like the pumpkin seeds in one of my favorite soups, Chicken & Green Tomato Pozole. And the scraped and roasted pumpkin makes fabulous pumpkin pie! Click here to get my recipe. See my step by step instructions for how to make your own pumpkin pie filling from a whole pumpkin in my post 10 Steps to Cooking Fresh Pumpkin for Pie. Your instructions leave me confused. Is the following sequence correct? Does this boiling just make them easier to shell but taste like lima beans ? Do they taste better not boiled like you prefer the taste of edamame? Hard to shell without the boiling? I prefer the taste of the roasted seeds to the boiled. The flavor is a little like edamame, while the roasted ones taste like overcooked lima beans. Correct. Roast, crack, boil “to efficiently remove a lot of seeds from their shells.” When I use a lot of hulled pepita in recipes, such as in my Chicken and Green Tomato Pozole, it is less time-consuming to peel a lot of them if I have boiled them first, to help them more easily release from their shells. The roasting makes the cracking easier, which makes the shell removal easier, whether you follow with a quick boil or not. I’m sorry if that sounds confusing. For nibbling, one-at-a-time, I prefer omitting the boil step and to just sit with a bowl of roasted seeds, cracking each one as I go, as I do with sunflower seeds or pistachio nuts. This leaves them with a roasted, nutty flavor, rather than the bean-y flavor of boiled.